Just curious if anyone has any info on these two, particularly this first one. The lack of a letter prefix on the serial, plus the Oxford speaker, suggests to me that it's really early (ca. 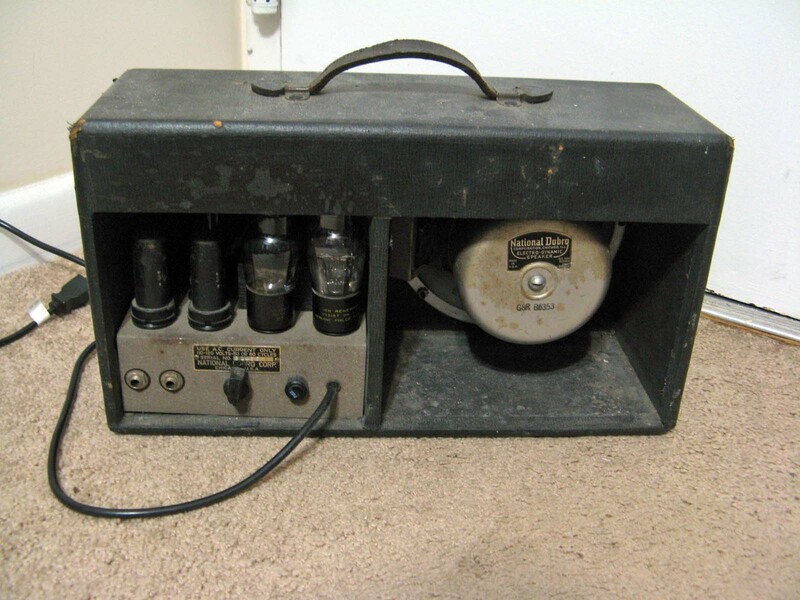 1935) but I haven't been able to find any identical amps. It uses two 6V6s, two 6N7s and an 83V rectifier, if that helps. The second one appears to be a National Model D, but I haven't seen another D with a coverplate over the speaker. It appears to have a duco finish. Both amps have been serviced and work fine, though the D has a significant cabinet rattle. 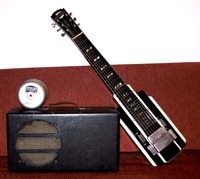 Your Dobro amp looks to me like a 1937 Dobro version of the National Model 'A'. In fact, according to my information, I think they are both 1937 amps. I think you need a copy of Mark Makin's book 'Palm Trees, Senoritas & Rocket Ships' ....The history of all things National, Dobro, Supro....etc. 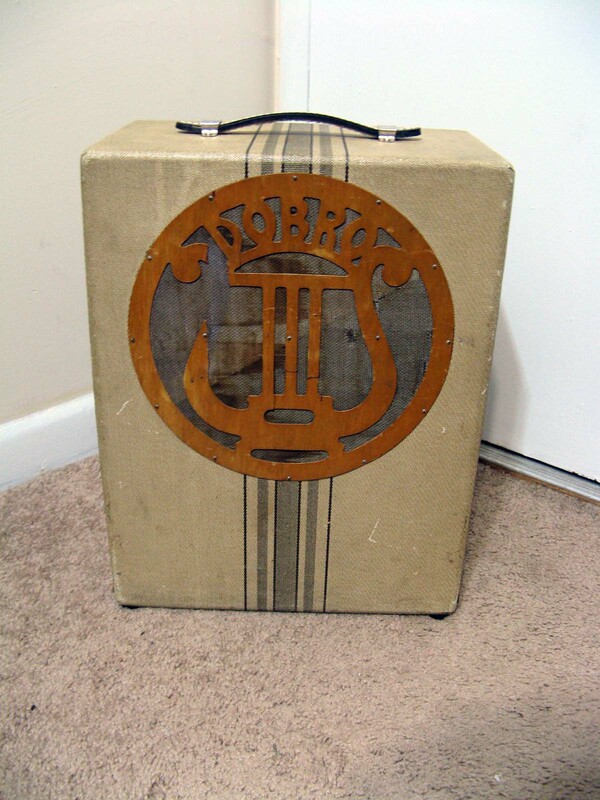 are there any tube markings on the chassis, or tube identification/replacement sheet inside the cab? 2x6V6 power calls for an 80 full wave rectifier. the 83 is a mercury vapor full wave four pin like the 80. 80 for 400V max. just wondering if it could have been substituted at some point. 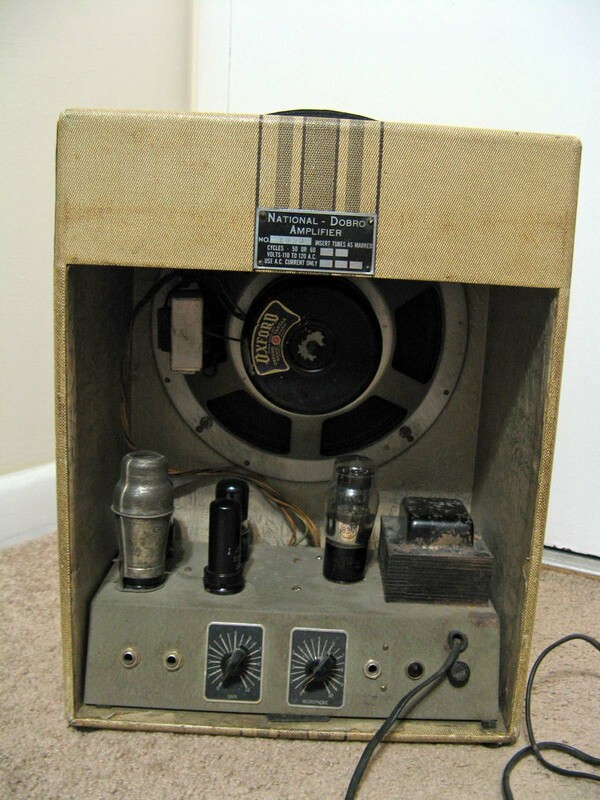 I have often wondered if amp with a field-coil speaker (pre-war amps often used an electro magnet on the speaker, rather than a ceramic/alnico) could have a master volume by reducing power to the field coil. This would mean you could `drive` the amp hard at low volume. take expert advice before you try this , there may be something I have not thought of, like would the speaker coil overheat ,as it is not moving so much with the field-coil power reduced, would the full power of the amp now be too much?? Agreed, it looks a lot like a National A, but there's no Dobro-branded version in the book and no pic of the back panel so I couldn't be sure. Those tube IDs are written on the sockets, and the tubes themselves all match the sockets. Wouldn't it be easier to put a conventional MV between the preamp and output sections? As I understand it, the field coil wouldn't affect your ability to do so. Noah, there is no catalogue reference, but it is the identical amp to the National. It just has a different wood-cut logo. They probably did it to supply to one of their Dobro dealers, or something like that. I don't think there is any mystery, it just got a Dobro front instead of a National. They are cool amps, but be careful as they can be dangerous! 40s and 50s amps are safe, but 30s models were never safely built. I only know this because my amp guy had one of my 30s amps in for repair and said it was not safe to use! Thanks for the answer! I was kind of hoping that it would be a rare early '30s model that matched my All-Electric guitar, but they make a nifty set even if they're a few years apart. There's no inherent reason why '30s amps are unsafe to use, though, as long as they've had a grounded cord properly installed (which, admittedly, this Dobro hasn't). You may be thinking of transformerless amp designs of the '50s, which have the potential to run wall voltage through the chassis. The 30s amp of mine had no grounding (Earth) and that's how it was supposed to be! Really not safe, especially with 240 volts in the UK. It had the potential to kill its user! I use 50s Supro amps and a little handmade Champ copy which are great amps and safe to use. I've been using them for 20 years. I would like to hear your amps. Until this morning I had not seen your avatar photo. Is the Dopera Original banjo yours? It's beautiful. Yes indeed! It weighs more than my car, but it sounds great. Not really the picture I wanted to take (no sunlight for more than a week now) but here's a couple of about the same age. The model D amp has the Mercury tube too. Lost the screw to fix the cap on the speaker. Seems to be some special thread. Pete1951, you are correct in your conjecture about field coil speakers. The idea of varying the field voltage has merit, primarily for tone rather than volume variation though both would occur. Beyond a certain lower voltage limit though the voice coil would be taxed, as input signal that does not result in cone motion must be dissipated as heat. As the field strength is reduced the heating increases. Old speakers with paper voice coil bobbins and low temperature adhesives would not do well. We live (perhaps unfortunately) in an era of multi-thousand watt voice coil ratings though, so a modern speaker could no doubt be built to stand up to these conditions. 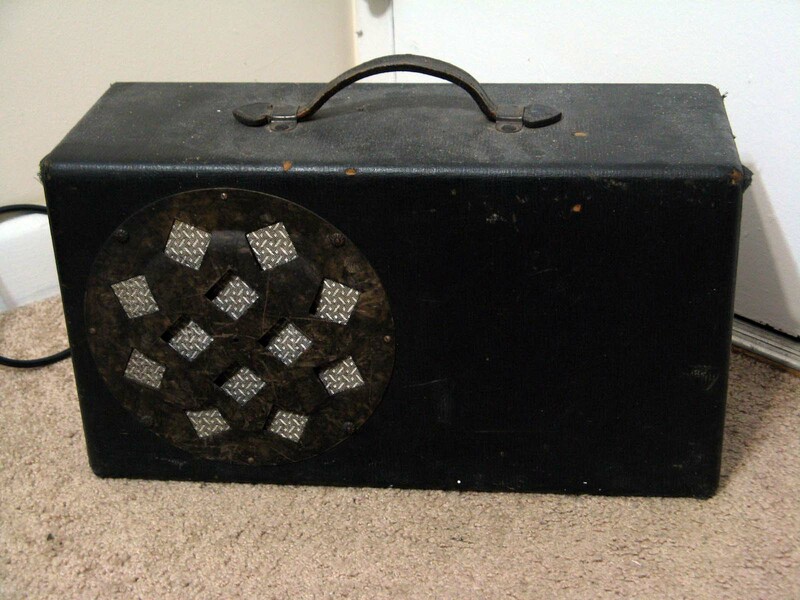 I am surprised that the guitar amp world is so ho hum about field coil speakers. In the prewar era most high output speakers were field coil due to the poor permanent magnet materials available, though after the war the improved magnet materials produced for radar use quickly obsoleted field coils. Many advanced modern audiophiles have discovered the fine listening qualities of field coil speakers, though the guitar world has yet to catch up.